"I thought I was the only one my size in the whole world!" Former Disney animator Don Bluth began his formal threat against The Mouse with the 1982 classic The Secret Of NIMH, which still stands of one of finest animated films in his career. As years went on, he tossed out a few other well-made animated features, including An American Tail, The Land Before Time, All Dogs Go To Heaven, Anastasia and Titan A.E.. Thumbelina, which is Bluth's reworking of the classic Hans Christian Anderson fable, falls short of his landmark works, and settles in just above the blandness of A Troll In Central Park, and below the rock 'n' roll humor of Rock-A-Doodle.This is the story of an extremely small girl, no bigger than your thumb, who was born in a magic barleycorn. The daily rigors of being the size of a thumb have led Thumbelina (Jodi Benson) to think that she is the only person in all of the world that is so small. Good fortune shines on her when she meets Prince Cornelius (Will Ryan), who just happens to be some kind of winged fairy creature, who is also the son of King Colbert (Kenneth Mars) and Queen Tabitha (June Foray). Thumbelina and Cornelius are obviously meant for each other, and they dish out a sugary dose of woo to each other. To provide the necessary drama for the remaining 70 minutes, Thumbelina is kidnapped by a group of evil toads, led by Mrs. Toad (Charo). 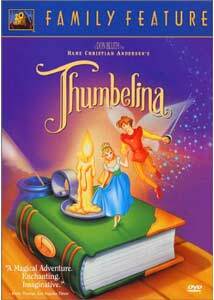 As Cornelius tries to find his thumb-sized dream girl, Thumbelina somehow manages to escape and she struggles to make her way home, amidst an assortment of danger.From a six-year-old's perspective, I'm sure this film is a genuine charmer. But for anyone else who has seen how well Disney and Pixar have created clever, funny animated films that work on multiple levels, then Bluth's Thumbelina will seem particularly tame in comparison. There is no attempt to corral older viewers into the experience, and Bluth has dramatically limited the appeal of this film by doing so. Little Mermaid's Jodi Benson, who delivered the goods so well musically as Ariel, doesn't manage to even come close to that solid performance here. Perhaps it's the downright dull songs that stifle her strong voice, but there just isn't any spark whatsover. Her voice is so identifiable that it's a shame to see it all but wasted here.Thumbelina, with it's sub-standard animation, falls far short of matching the quality of Bluth's earlier works. But again, I realize the target audience is not a 42-year-old guy with the makings of a beer belly. Image Transfer Review: Thumbelina is offered in two formats here: 1.78:1 anamorphic widescreen and a 1.33:1 pan-and-scan version on the flipside. Nary an imperfection to be found on this disc, with colors retaining a consistent palette of soft pastel colors, which is typical of a lot of Bluth's later works. Black levels are solid, and the overall image transfer displays strong detail.While the animation is not enough to enthrall the adult crowd, the presentation here will surely wow the intended audience. Audio Transfer Review: Fox wisely has forsaken wasting an elaborate 5.1 mix in favor of an efficiently produced 2.0 surround track that delivers all of the necessary dialogue and music naturally to five-year-old set. Spatial imaging is not pronounced, but the overall dialogue and soundtrack, including a dizzying amount of subpar Barry Manilow-penned songs, comes across cleanly. The bulk of the action is spread across the front channels. Perfectly serviceable. Extras Review: A couple of Thumbelina television teasers and a set of trailers for assorted Fox titles are the extent of the extras here. The under six crowd will surely be wowed, especially the girls, but anyone else will get a bad case of the cringies during some of the overly maudlin original songs. Certainly not the best that Don Bluth has ever produced, but it is still far better than having to sit through a Pokemon movie.Based strictly on the intended audience of young viewers, I would have to say this film works well enough, even with it's overall lack of substance for older viewers.